These homemade scones are a burst of summer; oodles of juicy blueberries and just the right amount of Sola® make for a winning al fresco breakfast! Preheat the oven to 380F/190C. Line a baking sheet with parchment paper. Sift the dry ingredients into a bowl, and stir well. Grate the frozen butter (with the fine side of a cheese grater) over the flour mixture, and gently mix in, making sure it is evenly distributed. Add the fresh blueberries and stir well. In a separate bowl, whisk together the buttermilk, egg, and vanilla extract, then pour into the flour mixture. Use your hands to mix the ingredients into a soft dough. Transfer the dough to the baking sheet and form it into an eight-inch-diameter disk, then use a sharp knife to cut it into eight equal-size wedges. Place the baking sheet in the oven and bake for 20 to 25 minutes until the scone disk has risen, and is golden-brown and cooked through. Place the disk onto a rack to cool while you make the glaze. 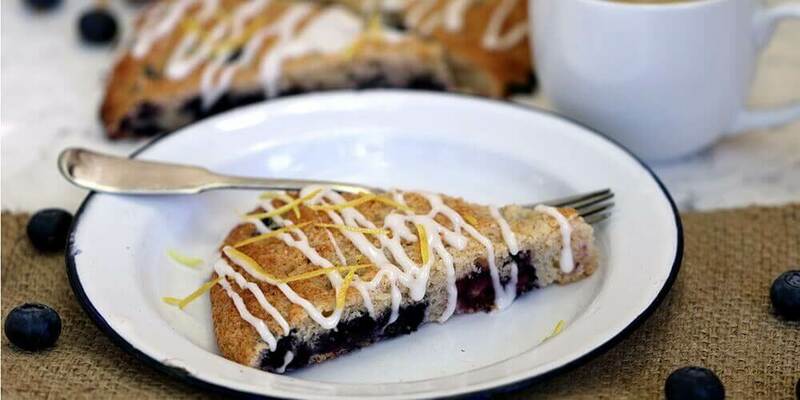 Make the glaze: place the Sola® and lemon juice into a pan and heat until the sweetener has dissolved. Remove the pan from the heat, cool the mixture to room temperature, and whisk from an opaque gel into a smooth, white drizzle glaze. Cut the scones into wedges using the marks you made before cooking, drizzle the glaze over the tops, and garnish with fresh lemon zest.